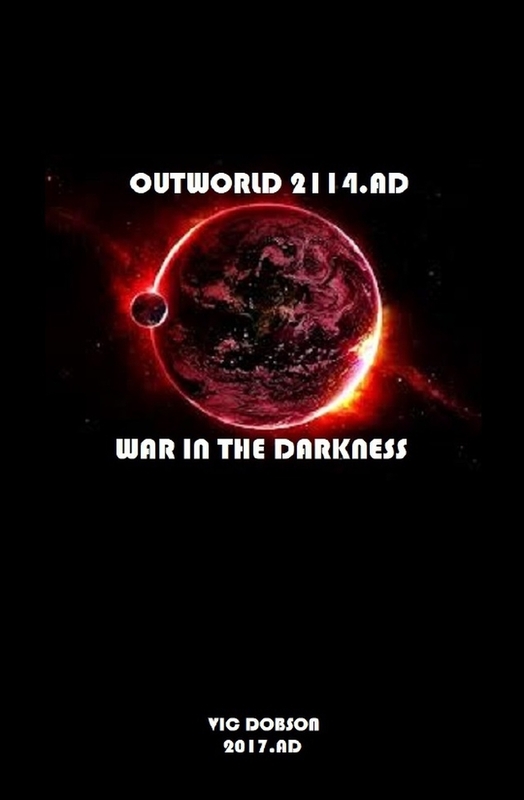 Written by wargamer Vic Dobson we are proud to present to you for free download a thirty four page book called Outworld 2114AD War in the Darkness. This is a campaign setting for USEME particularly for UM001 15mm Science Fiction and UM006 Starship Battles. 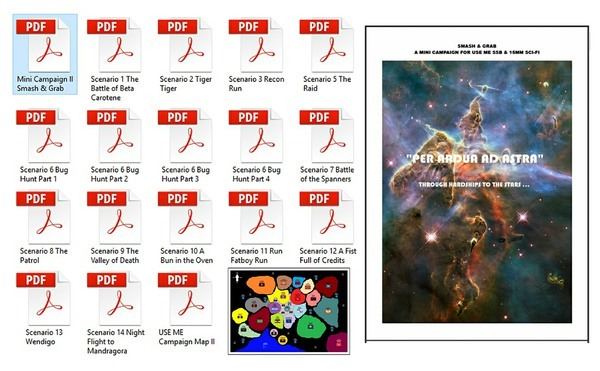 It contains many things including an introduction, setting, special rules, starship design and lots of scenarios. It can be played with any of your suitable miniatures including those from the HOF and Laserburn ranges for the ground action. Go HERE for the free book plus the USEME Range of titles as paid for downloads. Welcome to Outworld 2114.AD, a setting for USE ME 15mm Sci-Fi and USE ME Starship Battles. Within this title you will find all you need to fight the battles for Humanity's survival in the near future. This document does not repeat the basic rules as used in USE ME 15mm and SSB but instead replaces some parts and adds to or removes others. To help in understanding the changes made this document in arranged as per the USE ME rules, with any changes made described when required. Part 1 is USE ME SSB and is dealt with first; Part 2 is USE ME 15mm Sci-Fi. Get the free book from us by clicking HERE for the download from our website. This is one of the biggest give away titles we have ever hosted. We have another bundle of free fun for USEME by Vic Dobson for you to download from back in July! 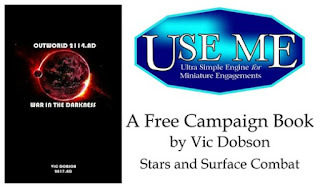 Written by Vic Dobson the mega bundle is a fantastic free edifice of USEME scenarios and more. Sixteen single and loosely linked scenarios. The Battle of Beta Carotene, Tiger Run, Recon Run, The Raid, Bug Hunt (parts 1,2,3,4), Battle of the Spanners, The Patrol, The Valley of Death, A Bun in the Over, Run Fat Boy Run, A Fistful of Credits, Wendigo and lastly Night Flight to Mandagora. On top of this is the mini-campaign called Smash and Grab. There is also the space map that goes with all the scenarios and shows the factions. This is a mighty mountain of free gaming material lovingly assembled for your enjoyment with every scenario being fairly small scale with a playing time of ten to forty minutes. They make use of Alternative Armies miniatures in the pictures and of Vic's own table layouts and graphics. Click HERE to download the free mini-campaign and fourteen scenario plus map bundle from our website as a zip file. Enjoy! 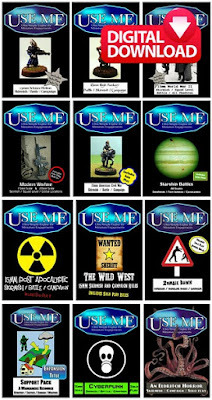 There are more than dozen titles in the USEME Series with more to come. Written by authors including Gavin Syme (GBS), Omer Golan Joel, Kurt Benson, Bob McAlister and Alex Scott. If you click on your chosen title on our website you can learn all about it, what period it covers, its contents, a short article on it and pictures of pages too. 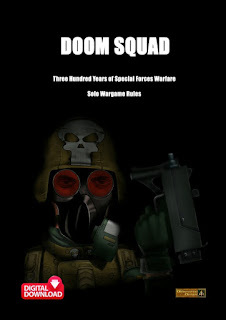 Do you Want a Set of Wargame Rules that are Fun, Simple and Elegant? That are used all over the World and take only minutes to learn? Look no further! We offer the whole range as great value digital downloads which you are free to print for your own use. Every download contains the book, its covers plus an 'ease print' version for simple printing at home. At just 3.00GBP price for a set of rules immediate...its awesome! Go HERE.